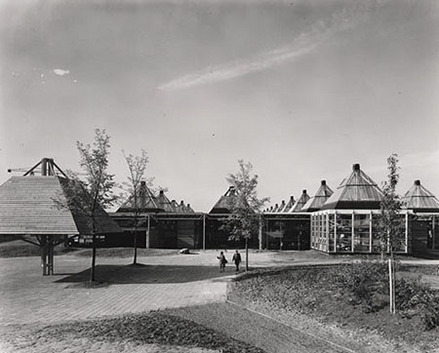 The architect Frank Van Klingeren designed a community centre for the new district of Herzenbroeken in Eindhoven. Het Karregat included all the shops' under one roof —an umbrella-like structure— alongside other social, cultural, health and educational facilities like the school, the public library, the general practitioner doctor, the bar and the supermarket. His aim was to bring people into contact with others more easily fostering mutual understanding. He did it removing the walls and combining the different functions of the facilities. The community centre had a central space that functioned as a public square where the community programmed and organised all kind of cultural activities and events. 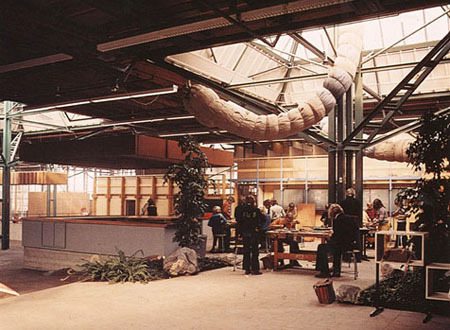 In 1977, the structure was modified because of noise problems in the open-plan school, erecting walls and reverting the school to traditional lessons. Finally, by the 1990s the structure had been changed drastically moving away from Van Klingeren’s community vision. To involve residents in the decision making concerned the local conditions of a new area and their interests. To build a community bringing the people closer together and challenging architecture, creating for fluid, open structures. Het karregat was a social experiment that succeeds in ist time involving residents in the decision making concerned the local conditions and interest for a new district. It provided a new cultural and social space for the inhabitants. In the long term, it contributed to the democratisation of architecture so that openness, mixed functions, and occupant involvement in planning are topics still discussed today, as illustrated by proposals to redevelop Hoog Catherijne and the railway station area in Utrecht. Children and their parents, Geestenberg inhabitants.